Sciatica is a general term used to describe pain radiating into the thigh and leg, usually along the path of the Sciatic nerve. It can be caused by several conditions but most commonly is associated with a damaged lumbar disc. Piriformis syndrome can also lead to sciatic nerve type symptoms. The mobile part of the spine is formed by 24 vertebral bones, piled on top of one another to form the spinal column. The lower section of the back is called the lumbar spine and has 5 vertebrae (referred to as L1 to L5). The lowest vertebra of the lumbar spine, L5, connects on to the top of a bone called the sacrum. Between the vertebrae are Intervertebral discs, made of a tough connective tissue or annulus around the outside of a spongy central part called the nucleus. These fibres help the disc withstand tension and pressure, like a shock absorber. Between the vertebrae of each spinal segment at the back are two joints called facets. The alignment of the facet joints of the spine allows movement of the back or neck to bend or rotate. The vertebrae are held together by tough fibrous, rubber band like tissues, called ligaments. 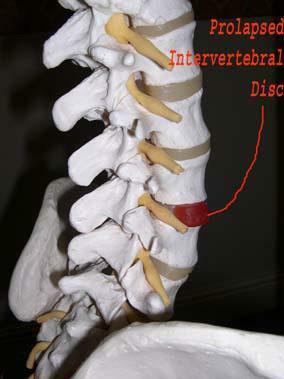 Disc herniation occurs when the toothpaste like nucleus in the centre of the disc squeezes out of its normal space. The nucleus presses against the outer part of the bag or annulus, causing the disc to bulge outward. Occasionally the nucleus pushes completely through the annulus and squeezes out of the disc. Normal daily actions can cause the nucleus to press against the annulus but when we are younger the body is normally able to withstand this force. But, as the disc ages, it tends to split and repair with inflexible scar tissue. As we get older the disc weakens, and the nucleus may begin to push through the damaged annulus, and sometimes to herniate completely through. Inappropriate bending, sitting, twisting and lifting puts enormous pressure on the disc and can lead to disc prolapse or herniation. Pain can come from inflammation which occurs when the nucleus squeezes through the annulus, which in turn can cause a muscular "spasm" which is painful in itself. A disc herniation may also put pressure on a spinal nerve or its blood supply causing pain along the course of the nerve. This is often referred to as sciatica. Often pain can start gradually as a dull ache in the back, often to one side and can come and go over a period of time, often years. At this stage there are only small tears in the annulus and small bulges in the disc. As the split extends you may often feel pain in the buttocks or thighs. However, when the disc herniates completely through the annulus, it generally causes immediate or gradually worsening sharp pain that starts in one buttock and shoots down part of the leg. The only presenting pain at this point is in the leg, "Sciatica". The pain can travel all the way down the leg and into the foot. Generally speaking, the further the pain goes down the leg , the longer the problem will take to get better! The nerve trapping can also lead to "pins and needles" and numbness in the leg, usually in the foot, and occasionally weakness is noticed in the muscles which move the foot. In the most severe of circumstances symptoms involve changes in bowel and bladder function. A large disc prolapse that pushes straight back into the spinal canal can put pressure on the nerves that go to the bowels and bladder. The pressure may cause low back pain, pain running down the back of one or both legs, and numbness or tingling between the legs in the saddle area. Rarely the pressure on the nerves can cause a loss of control in the bowels or bladder. This is an emergency! This may need immediate surgery to untrap the damaged nerves.